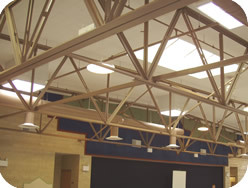 An energy savings study for a daylighting application at Yvonne Shaw Middle School (Washoe County, Nevada) was performed in 2004, by TLC IntegrationIntegration Systems, in order to apply for a NevadaSureBet customer rebate. NevadaSureBet is a program sponsored by Nevada Power and Sierra Pacific Power and administered by KEMA. This program provided a cash rebate to the school upon evidence of energy demand and consumption savings obtained by installing the daylighting system throughout the school. Daylighting is a state-of-the art technology using dome lenses and diffusers to transmit direct and ambient sunlight through a reflective light shaft to evenly illuminate an interior space. T-5 lamps are integrated into the daylighting modules to provide additional staged lighting when ambient daylight harvesting is insufficient or unavailable. 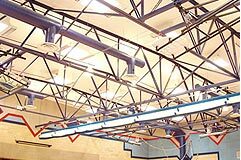 The daylighting retrofit at Spanish Springs consisted of removing 92 original fixtures (24 x 400W HID, 6 x 500W HID, 15 x 110W F032T8, 47 x 70W 2×2 fixtures) and replacing them with 67 daylighting units (30 tracking 4×4 fixtures and 37 passive 4×4 fixtures with 381W T-5’s). 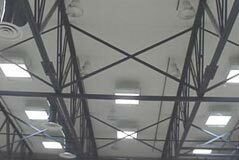 This allowed sunlight to illuminate the gym, library and other areas during daylight hours, thus saving energy. Furthermore, integrated control systems were connected with staged lighting that sensed lighting levels and occupancy to determine if and how much additional electric lighting was needed to maintain comfortable light levels. The energy savings calculations consisted of a comparison of the estimated annual energy use of the old fixtures versus the energy use of the new daylighting systems. The energy use depends on the amount of available daylight during normal hours of use of the facility. In the Spanish Springs study, we assumed 20 days a month of use with an average of 12 hours a day (nominally from 7 AM to 7 PM). This provided a total of 2880 hours per year. The amount of usable daylight was based on the hours per day – from 1 hour after sunrise to 1 hour before sunset – that fell within the nominal usage window. The calculation was based on astronomical data for the year and yielded a total usable daylighting availability of 83% (or 97% during the peak demand times of June-Sept) (1,2). Additionally, historical weather data was gathered for the region, to include climatic conditions – such as the number of cloudy and clear days – in the daylight availability calculation. The Spanish Springs area receives sunny or partly cloudy days 68% of the time during the 83% daylight period, for a total of 57% sunlight availability (3). This means that for 57% of the school’s operational time, daylighting is sufficient to provide all the lighting needs and electrical lighting is not required. Of the remaining 43% of the time, it is assumed that half of this time will require half the staged lights to be turned on, and the other half of the time all the lights will need to be turned on. Additionally, accommodation is made for the occupancy sensors. Based on numerous studies, it is conservatively estimated that the school will save 40% from the use of occupancy sensors (4). The end result for Spanish Springs is that an annual consumption savings benefit of 33,092 KWH or 66% is obtained from the daylighting application. This figure was accepted by KEMA in the NevadaSureBet application and was used to calculate the school’s subsequent rebate. These power quality solutions were accepted. As an experiment, the data was re-calculated assuming that the Spanish Springs Middle School was located in Las Vegas. The type and extent of the retrofit was kept exactly the same – only the weather and astronomical data was adjusted for Southern Nevada to take into account the greater number of sunny days predominant in Las Vegas. The result was an annual consumption savings of 37,172 KWH or 74% (for a savings total that was 4,000 KWH or 8% better than the Washoe County result). For Reno, NV and Las Vegas, NV. Astronomical Applications Dept., Rise and Set for the Sun for 2004 and 2005. Average Peak Demand defined as June-Sept inclusive 1-7 PM (as per Kema, based on Power Company policy for the rebate program). Historical weather data for Reno and Las Vegas, from Western Regional Climate Center. Data is based on daylight hours only. A clear day denotes zero to 3/10 average, sky cover. Partly cloudy is 4/10 to 7/10 tenths. Cloudy is 8/10 to 10/10 tenths. From FPL study, classroom energy savings of 40 to 46% due to occupancy sensors. Nema study (2001): Occupancy sensors in classroom application, energy savings of 52% using a 20 minute time delay period. – Saves electricity: It greatly reduces the need to use electrical lighting during daylight hours. – Maximizes color perception: It has a color rendition of index of 100 (compared with cool-white fluorescent lighting which has an index of 67). So colors are rich, true and vibrant. – Enhances object definition: Improves visual acuity by providing superior recognition of surface detail, text and graphics. – Is cooler: Daylight contains half as much heat per unit of illumination as other sources. – Is easy on the eyes: Daylighting creates no harsh glare, intense brightness, hot spots or flicker.